If you’d like to book an appointment to discuss jaw joint dysfunction with the dentist at Seymour Dental, then contact us, or call us in Dulwich Hill, Sydney on (02) 9564 2397. Jaw joint dysfunction (sometimes called TMJ dysfunction) can cause pain when opening the jaw, discomfort when chewing, unpleasant crunching or clicking sounds and stiffness in face muscles and headaches. It’s important to address the problem and Seymour Dental can help. Before any treatment is undertaken, your dentist will carry out a thorough examination to exclude broken filings, teeth or decay. These irritations can cause a person to unknowingly move their jaw incorrectly and strain the muscles and the jaw joint. 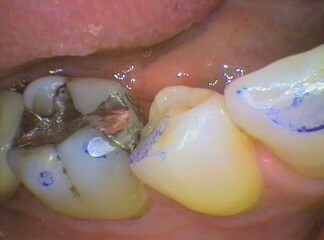 Sometimes a minor tooth movement due to function and wear can cause teeth to interfere with function and cause problems. Often simple adjustments to bite, fixing decay and repairing the teeth can be enough to resolve the problem, however if issues continue, then the bite is further analysed and the muscle function observed. A common treatment involves creating an occlusal splint – a firm acrylic removable bite plate that acts as a protective guard over the teeth (usually in the upper jaw). The splint provides an even bite and ensures the load is spread over all the teeth. This relieves the chewing muscle and reduces pain. The jaw joints, in turn, benefits from the reduced workload. 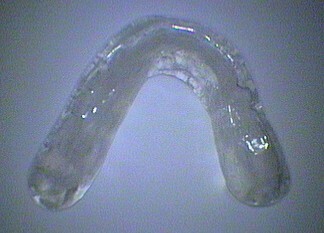 Occlusal Splint Appliance Grind mark as a shiny flat edge on tooth. Thin blue carbon paper used to assess bite.